Traditional working cultures make it difficult to stay active in the office and sitting still all day can lead to a whole host of health issues such as back ache, sore shoulders, neck strain and even heart disease. In the office design and fit-out process, Rapport work closely with the HR and Facilities teams to help identify the utilisation and activity of workspaces. And it’s no secret that a mostly sedentary lifestyle can lead to weight gain and a shortened life span, so we help to rethink existing spaces or the early stages of an office design to produce a workplace that takes into account the work-style needs of teams and individuals to create a flexible, healthier and a more modern way of working. 1. 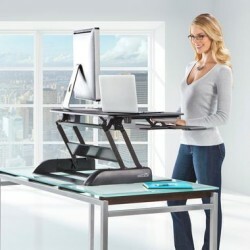 A standing desk or a table that you can easily adjust to different heights can prevent your body from being in the same position for hours on end (propping up your computer on some books on a regular desk or moving your laptop to a nearby counter that is a comfortable height for standing can also help. 5. Finally, if you’ve got cash to flash, you could always invest in a Treadmill or bicycle desk, which are gaining in popularity. Most importantly staying active in the office during your day will help your work motivation and overall health. *England and the Active Working Community Interest Company explains just how long we should be standing. The statement, published in June 2015 in the British Journal of Sports Medicine, suggests that four hours of standing during each workday may be the ideal target.